EasyCare comfort pads increase solar support so that all horses, sound or unsound, are encouraged to move correctly. They can also be used to improve the fit of a hoof boot. Use them in hoof boots to help transition a horse from shod to barefoot, or as an aid in the treatment of laminitis, navicular and other hoof ailments. We recommend you work with your veterinarian or hoof care professional when treating any type of hoof pathology. 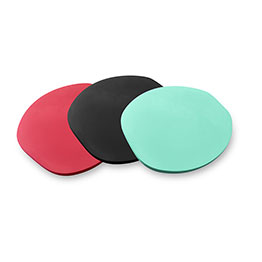 Comfort Pads are available in two thicknesses (6mm and 12mm). EasyCare Comfort Pads must be cut to size. Simply stand the horse on the pad, trace around the hoof and trim the comfort pad with scissors to the outline of the hoof before placing the pad in the hoof boot. Only available in medium density (black).